Once upon a time we walked down the panhandle, past the ash trees to the reed bed and the weaver’s nests. We were smitten. 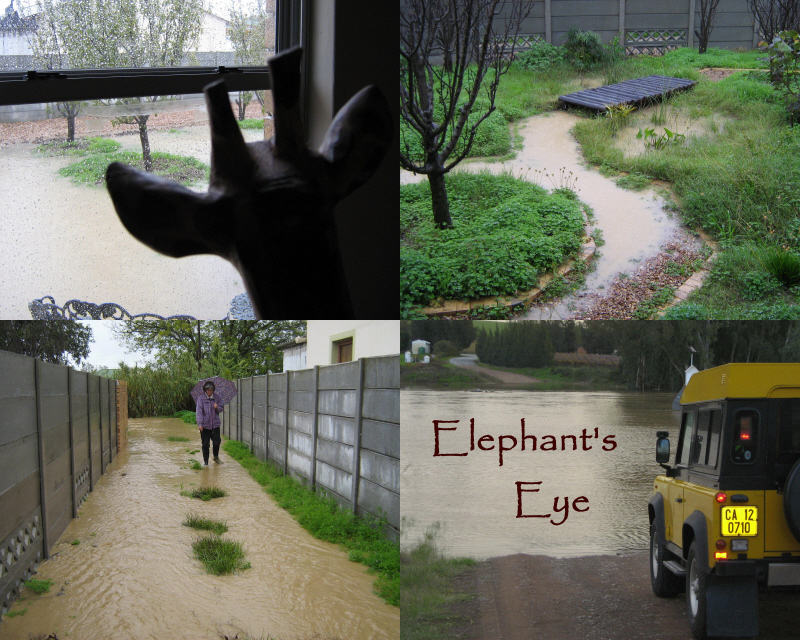 We moved in to our new home in May 2007, and in June the rains came! In 2008 July brought the river down our gravel driveway. This August we had 174 mm of rain, but graciously dispersed across the month. Leaving our clay soil charged with water for spring flowers and sparing us from new floods. The Ungardener worked hard at rain gardening. Our driveway and forecourt are paved with gravel. There is a buried porous pipe which helps to drain excess water to the reeds. Ultimately all our accumulated flood water finds a path across our neighbours to the Porterville stream and down to the sea. 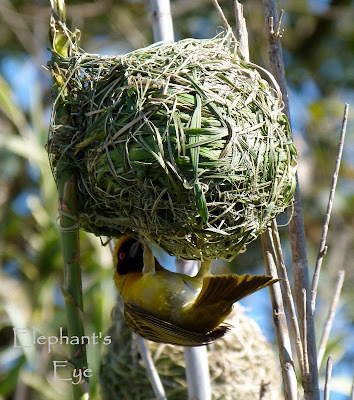 For the weavers and their nest building, I leave some tall wild grass that the birds can harvest. Giant or Spanish reeds are an invasive plant from the Mediterranean (the plant for which the French town of Cannes was named). Our reeds are a reminder that our chosen plot lies in a hollow, gathers the rain, and allows the reeds to flourish. 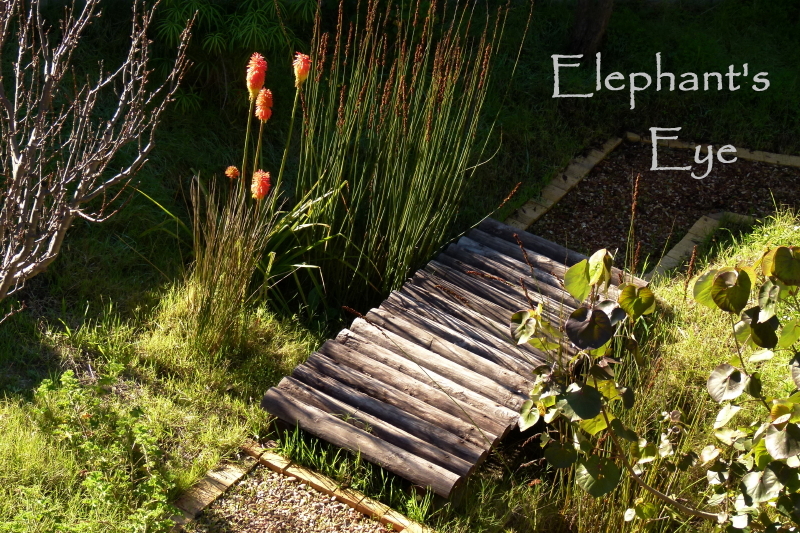 I’m allergic to little garden bridges which serve no purpose. Ours crosses Plum Creek. In summer the boggy plants are dormant, in winter they paddle in water. Hibiscus tiliaceus with its heart-shaped leaves always glowing in autumn colours, red hot pokers, olifantsriet and my pots of vlei lilies Wurmbea stricta. As you circle the house, the western roof drains to the reeds, ensuring that they continue to survive with their accustomed supply. The southern side goes to a rain water tank, which overflows to Apple Creek. The eastern side goes to the second rain water tank and overflows to the pond. The northern side goes straight to Ungardening Pond. 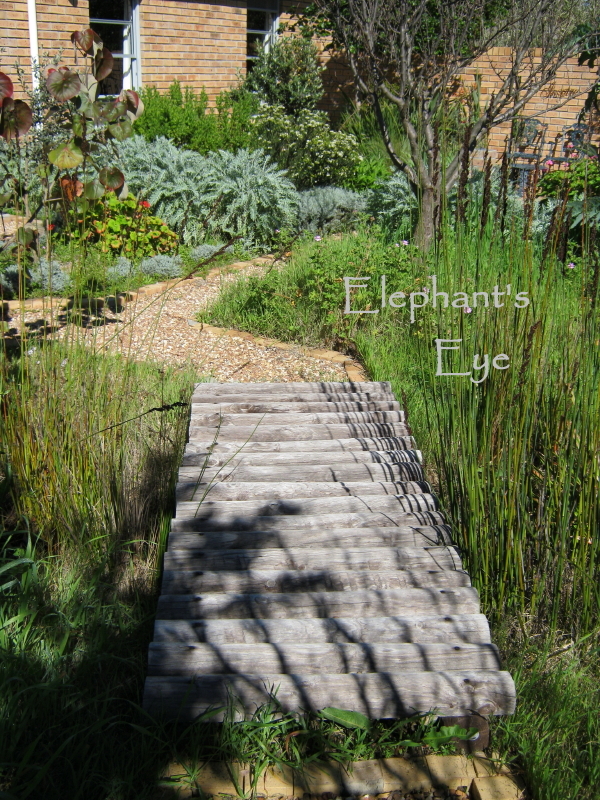 All our paths are brick edged gravel, keeping our feet out of the mud – and again helping to drain downpours from the plants to three storm water retention ponds. Here the Voelvlei dam is hidden in the middle distance between mountains beyond and the pristine renosterveld around the dam. 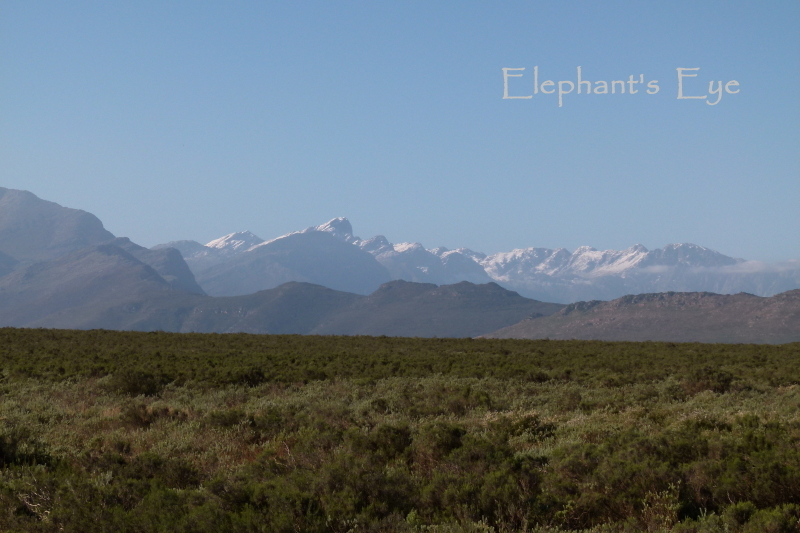 Named for the greyish renosterbos Dicerothamnus rhinocerotis (a sort of wild rosemary) which is supposed to look like a rhino, in colour. If I were trying to return our garden to what was here, before the town and the wheat and wine farmers – these bushes, with bulbs and annuals would be it. 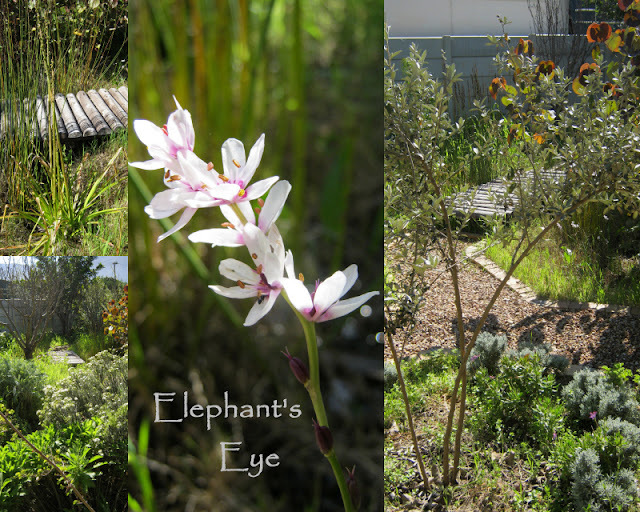 As we saw when we walked thru the Hantam National Botanical Garden, first in 2011, then in 2012. We are allowed to retain our rain water in our garden, but not allowed to collect the rain and channel a pipe to our neighbour’s garden. Our mediterranean climate means that winter can brings us short fierce cloud bursts and we need to be prepared. We wanted a home without stairs, but there are two stairs at each outside door – against extreme weather. Rain gardening neatly fits Beth of Wisconsin @ PlantPostings Garden Lessons Learned meme. Her summer, my winter! 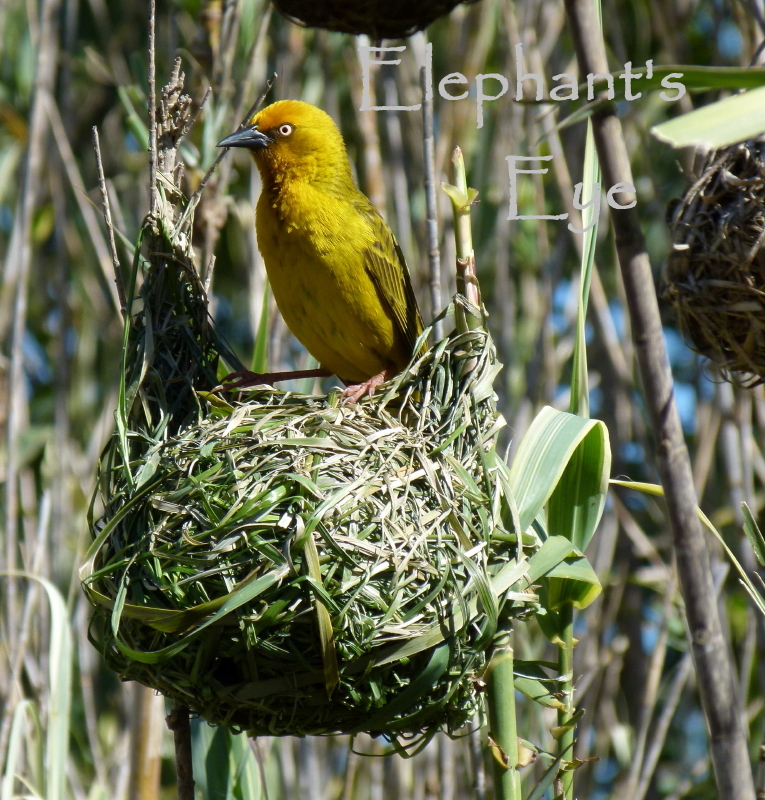 you always take us on such a wonderful ride, the majestic beauty of the mountain,s the amazing flowers and trees , the wild life, I could read this all day, I have never saw a masked weaver, they are beautiful, very talented nest builders!Such an intricate weave! I really like your garden bridge. And am very impressed with the way in which you have rain flowing into different areas, all with a purpose. Too bad, however, that your neighbor couldn't benefit from rain collected in your garden. I always liked your gravel paths but didn't realize they were designed that way because of the rain. This must be a very bittersweet time for you--looking back and preparing for the move. 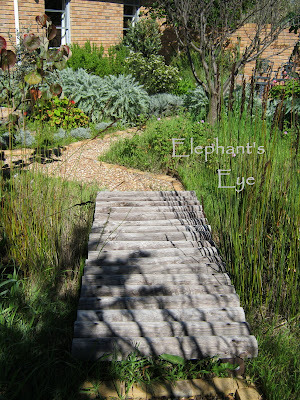 Your property under Elephant's Eye seems like a magical place, Diana. I will check back to read the previous chapters. This is a very enjoyable series. Oh, and thank you for joining in the meme. 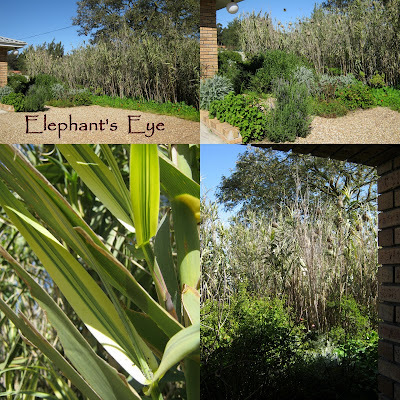 It's especially fun to compare notes with gardeners in the southern hemisphere. Happy spring to you! Yours is an amazing country with inherent beauty. The canola field is gorgeous. You have done so much at Elephant's Eye. I like your philosophy of water management. It must be so hard to leave, but then you have so much to look forward to! Rest assured, he's proud! He builds, she inspects. If she says NO, he rips it down. And starts again, and again ... till she IS satisfied. I'm surprised that there are restrictions on rain water. Shouldn't rain tanks be encouraged? Here we only need to make sure the containers or tanks are covered to prevent breeding of disease bringing mosquitoes. Bom, yes, the tanks are encouraged! It's directing your storm water to become your neighbour's problem, which is illegal. If you wanted to, you could simply send all rain to the stormwater drain. 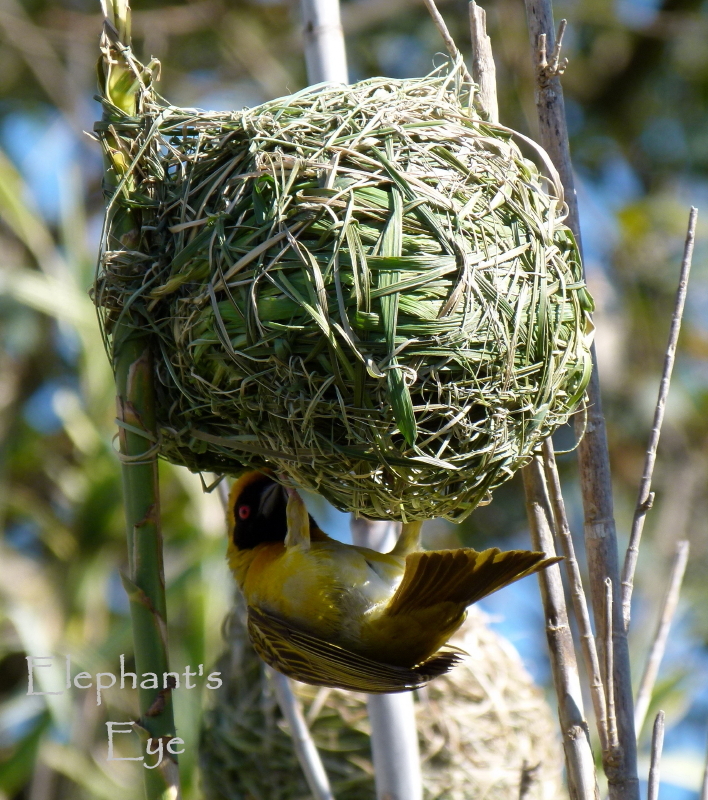 Diana, I love your masked weaver and its very unusual nest. I have clay soil and the way they graded our lots, I have water that runs to ditches, but floods my garden. 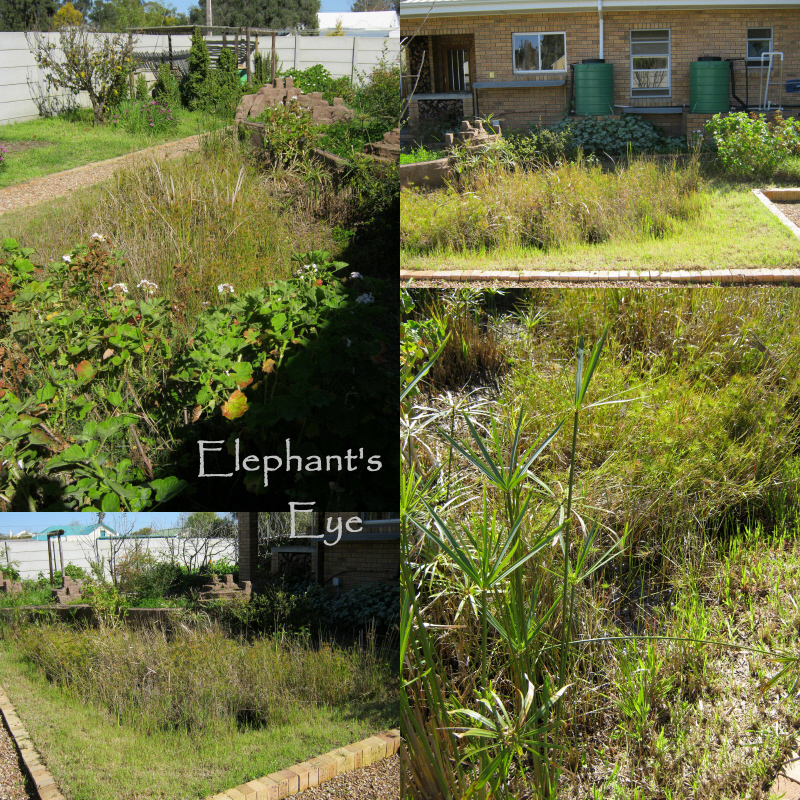 I have built a number of different rain gardens to help with the flooding. I like how you solved your rain and flood issues and not just sending it to the storm drain. 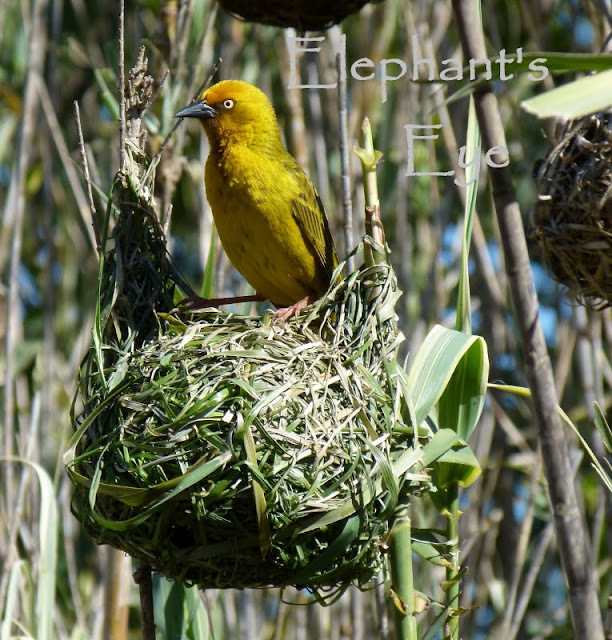 I really found your detailed information on how you converted the land use to be really fascinating and I to like the masked weaver photos.